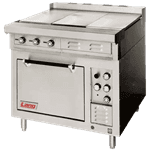 Commercial electric stoves are a popular choice for food services small and large because they provide easy, versatile installation. While commercial electric ranges may take longer to heat up and may cost more to operate than gas ranges, there are plenty of instances where an electric style is preferable over gas. 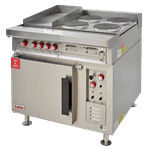 For example, food service businesses that can’t accommodate proper ventilation or gas lines should consider a commercial electric range. 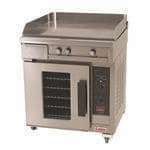 CKitchen.com has the best selection of high-quality electric units for restaurants, bars, supermarkets, food trucks, concession stands, carts, catering businesses, hotels, cafeterias and more. Commercial electric ranges are appropriate for businesses small and large, but are especially appropriate for kitchens with limited space. 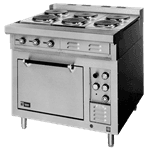 These relatively compact stoves do come in a wide variety of sizes, though, so they’re able to accommodate establishments of any size. Upgrade to a more efficient, organized kitchen with a style featuring extra hot plates, French plates, oven racks and enough all-purpose burners to handle any amount of frying, sautéing, boiling or browning that’s necessary for an efficient output during the dinner rush. 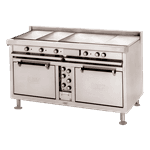 We even have simple “add-a-unit” electric ranges that you can use to upgrade your existing range with an additional burner or two. 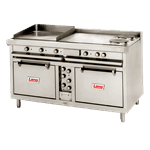 Heavy-duty commercial ranges are often equipped with more than just the cooktop. 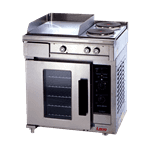 In fact, we have cutting-edge styles that are built with standard and convection oven bases that can accommodate several sheet pans for double-duty cooking. This is essential for bustling, commercial kitchens that need to maximize space. We only carry high-quality, yet inexpensive electric ranges by industry leaders, including Lang, Garland, Vulcan and Market Forge. Regardless of which style or brand you choose, you’ll always get a low-price guarantee and free shipping at CKitchen.com.